SABANETA, Dominican Republic — For decades, the people of Barrio Cementerio, a neighborhood divided evenly between Dominicans and Haitians, have shared a peaceful coexistence. Working side by side and raising families together helped keep tensions in check. That is changing. A government plan that could deport tens, if not hundreds, of thousands of people of Haitian descent from the Dominican Republic has started to tear at the unity that once bound the barrio, forcing residents to pick a side. A bitter landlord stopped renting to a Haitian tenant. The head of the local Red Cross says the deportations are long overdue, while a gang leader promises to hide his Haitian friends from the authorities. A Dominican husband fears losing his wife and their children, who have no papers. A police officer agonizes over the prospect of having to deport his best friend, who came to the Dominican Republic illegally from Haiti. Like much of the country, Barrio Cementerio is split, creating a patchwork of sympathy, prejudice and resentment born of crowded schools, competition for jobs and a beleaguered health-care system. Locals note that the Dominican Republic is a poor country that can ill afford the strain. But as it tries to tighten its borders in a separate effort called Operation Shield, the country is not alone in dealing with migrants with policies that rights groups challenge. The surge in migration from conflict and economic hardship has rattled nations the world over, from Australia to the United States. After threatening to breach European law by kicking out migrants, Hungary announced plans last month to build a 109-mile fence to keep out those hoping to enter the European Union from Serbia, unleashing protests from Serbia’s prime minister, who said it would turn his country into an Auschwitz. Bulgaria announced plans in April to stretch its border fence with Turkey 80 more miles, as part of its “containment plan.” Australia stops migrants arriving by sea and sends them to Papua New Guinea. Long before this, the United States was deporting hundreds of thousands of people and building walls to keep out migrants. Under pressure from U.S. authorities, Mexico deported almost twice as many Central American migrants through April of this year than in the first four months of 2014. “It’s a period of unprecedented human mobility, the greatest on record, with 1 billion people on the move,” said William Swing, director general of the International Organization for Migration, which helped the Dominican government register nearly 300,000 immigrants who were in the country illegally, out of an estimated 524,000. “There is a resurgence of anti-migrant sentiment driven by fear: fear of a loss of jobs, fear of the post-9/11 security syndrome, and then mostly, the fear of a loss of identity,” he added. The Dominican government’s threat to deport Haitians has been popular domestically, playing on the frustrations many Dominicans feel toward their poorer neighbors on the island of Hispaniola. The politics are straightforward. President Danilo Medina recently announced his campaign for re-election next year. Many praise his efforts to register migrants and expel those in the country illegally. 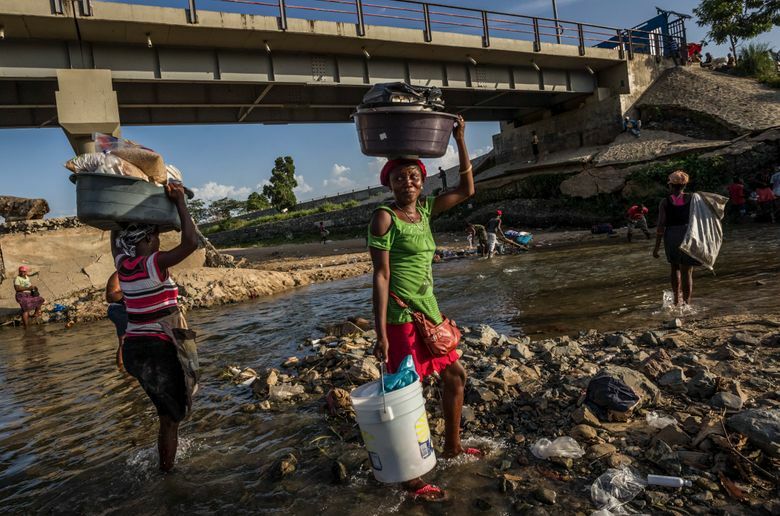 Sporadic deportations have happened, but so far, with the world watching, the Dominican government has not carried out the mass expulsions Haitians fear. Still, the threat of being seized has led more than 31,000 Haitians to leave on their own, according to government figures, opting to cart their belongings across the border rather than risk losing everything in a sudden deportation. Near the city of Puerto Plata, Haitians said unidentified Dominican men had arrived at their doors in the middle of the night, yelling threats and demanding they return home. The Organization of American States said last week that it would send a delegation to the Dominican Republic to examine the migration situation, including whether Haitian migrants have been forced out. In the border town of Dajabón, trucks loaded with furniture and tattered mattresses inched through crowds passing over the battered Friendship Bridge, which stretches across a river where, in 1937, a Dominican dictator, Rafael Trujillo, ordered the massacre of more than 10,000 Haitians. Twice a week, thousands of Haitian merchants are allowed to cross over to buy and sell everything from used clothes to crockery. In one market stall, a throng of Haitian men collected mounds of used T-shirts, stuffing them into plastic bags for a Dominican shop owner, Juan Liriano, who says he is conflicted about the deportations. He pays Haitian workers about $3.50 a day, and food. He must pay Dominicans nearly $11, not including transportation. But he says people must follow the immigration law. In the capital, Santo Domingo, the plan to register — or deport — Haitians has gone over well with many Dominicans, who often complain that illegal migration is a drag on the public system. In Barrio Cementerio, a neighborhood in the small town of Sabaneta, everyone knows everyone. Some stand behind their Haitian friends, refusing to be baited by the political winds in Santo Domingo. Others say that, friendships aside, it is time for migrants here illegally to leave. “If I’m living in this or any country as an immigrant, then I should get a job and work to make enough money to legalize myself,” said Francisco Peguero, president of the local Red Cross, who counts Haitians here illegally among his friends. Roberto, a Dominican who works at a souvenir shop in the nearby town of Cabarete, is married to Yoseline, a woman of Haitian descent. She has no documentation, though not for lack of trying. She obtained an affidavit with seven witnesses testifying that she was born in the Dominican Republic. Two days before the government’s registration deadline last month, the family was told by letter that the paperwork was insufficient. Their children, ages 3 and 1, would be forced to go with her, he fears. They, too, have no documents.